Thanksgiving. What a beautiful holiday. Based on a simple concept of saying “Thanks”. One of the magic words we are teaching our son 🙂 Such a simple word which conveys such a big gesture. I love it. So, over the years, my husband I have been fortunate enough to host Thanksgiving for our family and friends with no family around. We invite our neighbors and colleagues to partake in food and the festivities around the holiday. We have a big ole’ Turkey and all the traditional fixins’ along with some of my own creations. This Thanksgiving is going to be a little more special as my brother is coming from college for the holiday. We will have a full house. My sis will be in town too. So each one of us in the family have our own signature dishes we make. My sis makes a FABULOUS Risotto. I actually learned to make my risotto from her. You should check out my variation of a holiday style risotto here. I am really hoping she will make hers again this year. and of course my mom !! Well, she makes everything and all of you know I learned how to cook from her. but she makes this amazing Irish soda bread especially during the holidays which is absolutely DIVINE !! Check the pics here from last year. Before we all go cooking, here are a few random tips I have learned/read/liked over the years for this special day and I want to share them with you all. 3. Pop-up indicators are rarely accurate. Skip it and use an instant-read thermometer or meat thermometer. With the body cavity facing toward you, slide it into the thickest part at the bottom of the thigh, below and to the inside of the leg. Wiggle the tip to make sure it doesn’t hit bone. 4. 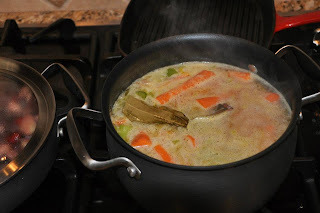 Make soups (non cream based) up to a week before and freeze it. A day before, thaw in fridge and add cream if needed the day of while heating. 5. Use hollowed out bread “bowls” to serve as containers for soups, dips and such. 6. Always have a vegetarian side dish(es). Some guests might enjoy a lighter fare. Make your soups with a veggie broth instead of a chicken stock. 7. Have low calorie options like dressings, whipped topping etc. You are the host. Be prepared. 8. Keep nuts on the side in-case you have a guest with allergies. 9. Assemble your casseroles a day or two before and bake on the day of. 10. Let the chutneys/jams sit overnight in the fridge to absorb all the flavors. 11. Clean the house the day or two before and not on the day of. You do not want added stress. This also includes table settings and center pieces. I will be posting some recipes here in a couple of days which you all can use to make your Turkey day a little special. As usual, “like” us on Facebook and ask questions if need be. Hope you all have a safe and a wonderful Holiday. Always remember; Food is a great leveler. Respect it, Cherish it, Share it. What do you all have planned for Thanksgiving this year ? 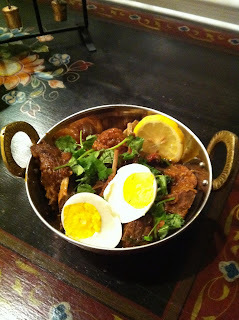 So, Freaky Curry hosted it’s first cooking class from it’s holiday series on Nov 5th 2011 and the 2nd one on Nov 12th . What a fun experience we all had!! 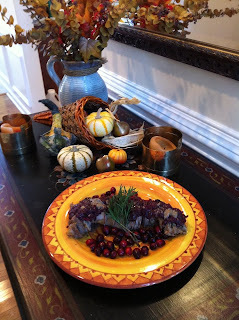 Pork tenderloin with an onion cranberry jam. Apples with a cinnamon spice crumble. The beauty of this menu was that a lot of the prep work could be done well in advance. Great for the holidays. I don’t know about you but I don’t want to slave in the kitchen on the day of. I want the house to be ready and myself to look put together instead of running around like a crazy woman with guests waiting for their meal. We first started off our class by making a fresh pot of coffee. I tried the Vanilla bean starbucks coffee this time. Delicious and definitely a good boost for what was going to be a busy morning. We then started our prep work for the different courses. Since our meat needed to be marinating for at least an hour, we made our marinade first and put the meat in the fridge. While the meat soaked up all the juices from the marinade, we proceeded to chop, cut and dice our veggies for the soup. Whilethe veggies were cooking on the stove for the soup, we then started our prep work for the onion jam/apple chutney. The class was “crying” while cutting the onions. Haha. This class was really prep-heavy and that’s the best part. Most of the dishes in this week’s class can be prepared before hand. We filled up our cups with some more coffee and hot tea and took time to write down our notes. As the jam and the soup were underway, we started the prep work for our Apple crumble. While some were wrapping up their notes and posting pics on Facebook :), we started tasting our “fruits of labor”. There was silence in the room J Always a good sign..
Join us the next time !! Like us on facebook and get frequent updates. Mix the above in a bowl till all the sugar coats the apples. 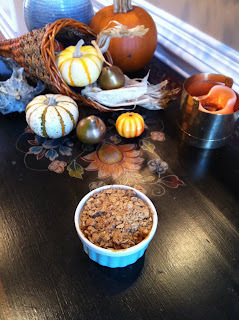 Mix the Spice crumble with both hands in a deep bowl till crumbly, almost peas like. Or use a paddle blender to get the same result. Line a baking pan/individual ramekins with some butter. Add scoopful of apples into the pans. Fill the top of the ramekins/pans with the crumble. Bake on a cookie sheet lined with parchment paper in a preheated oven at 350 degrees for about 40-45 minutes till the sugar bubbles around the pan. Enjoy hot/warm or at room temperature with whipped cream/ cold vanilla ice-cream. To generously serve 4-6 About 2 pounds of Pork tenderloins Marinade: ¼ cup of OO 2-3 sprigs of fresh Rosemary chopped Generous amount of salt and pepper Wash and pat dry the meat and drop in a ziplock bag. Whisk the marinade in a bowl and drop it in the ziplock bag. Close the bag and massage the meat till all the marinade coats the meat. Let sit in the fridge for atleast a couple of hours. 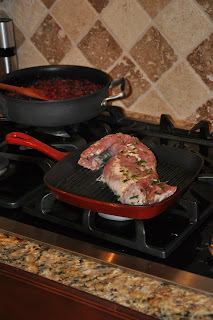 Sear the meat in a pan on high heat for about 3-4 minutes on all sides to get a good color. Roast the meat in a roasting pan at 350 degrees for about 34-35 minutes till the internal temperature of the meat is about 145-150 degrees. Remove from the oven, and cover with foil and let rest for about 10 minutes till the internal temperature rises to 160 degrees. 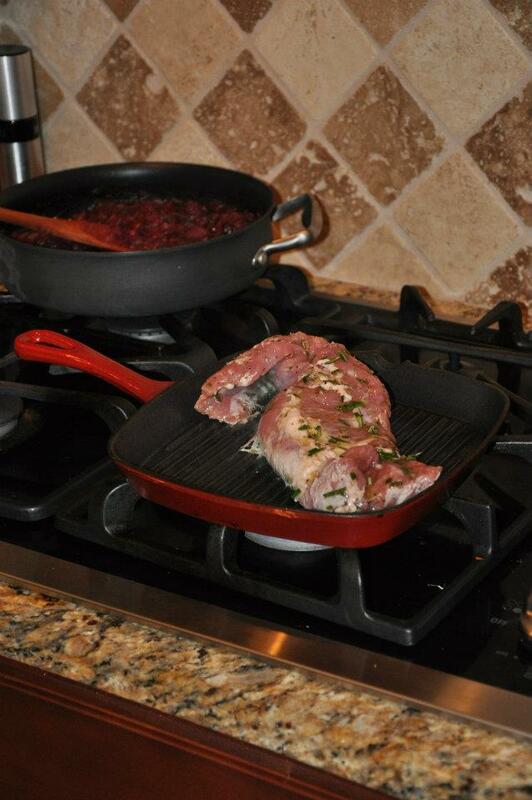 (Letting the meat rest preserves all the juices inside the meat and also rises the temperature to a desirable level). 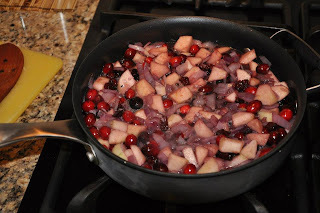 Serve with the onion cranberry jam or the apple cranberry chutney. Heat the butter and oil together in a deep pot on medium heat. (The oil prevents the butter from burning). Sautee the onions in it for about 3-4 minutes till they turn pink and lose the raw smell. Do not brown/caramelize. Add the carrots and celery and let cook for 4-5 minutes till the veggies are a bit limp. This will help release the natural aroma from the veggies. Add the spices and the broth. Lower to heat to a low-medium and cover the pot. Cook for about 30-35 minutes till the veggies are fork tender. (Almost mushy). Add the cream and cook for a couple of minutes more. Season with salt and pepper. Remove the cinnamon and the bay leaves. 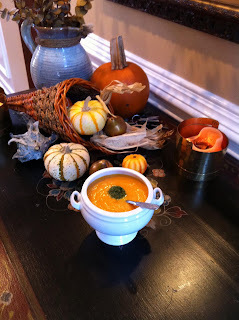 Use hand blender/ stand up blender to puree the soup to a soup consistency. 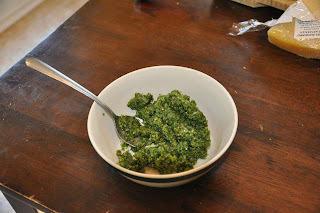 To serve as a garnish for 4-5 people 1 cup of parsley chopped 2 Tbsp of shaved good aged parmesan 2 Tbsp of roughly chopped walnuts ¼-1/3 cup of OO (Increase the quantity depending on the fluidity preference) Salt and pepper Blend all the above to a semi-solid consistency. Heat the butter and oil together in a deep pot on medium heat. (The oil prevents the butter from burning). Saute the onions and garlic in it for about 3-4 minutes till they turn pink and lose the raw smell. Do not brown/caramelize. Add the carrots and celery and let cook for 4-5 minutes till the celery is a bit limp. This will help release the natural aroma from the veggies. Add the potato and the squash. Add the spices and the broth. Lower to heat to a low-medium and cover the pot. Cook for about 30-35 minutes till the veggies are fork tender. (Almost mushy).Add the cream and cook for a couple of minutes more. Serve with sage brown butter. Heat the butter and the sage in a shallow pan on low heat for about 9-10 minutes while shaking the pan constantly to keep the sage from burning. Heat through till the butter solids cook and turn a shade of golden brown (NOT DARK BROWN). This should begin happening at about 11th-12th minute. Remove from heat and enjoy over soup/meats/stews. Marinate the meat in the marinade for atleast 2 hrs. Sautee the onions from the wet masala in a Tbs of oil for about 5-6 minutes till they turn translucent. Add tomatoes and green chillies and cook on a medium heat till the tomatoes lose their firmness (About 8 minutes). Add the meat and stir to incorporate all the ingredients for about 2-3 minutes. Add the Dry masala and continue stirring on medium heat for about 12 minutes. Add a cup of water and cover the pan. Lower the heat and cook till the water evaporates. (about 8-9 minutes). Repeat the process till you have used about 3 cups of water. The whole process should be around 40-45 minutes. Check for doneness on the meat. If not tender, add more water and repeat till desired doneness. Season with salt and red chili powder as per need. Squeeze the juice of half a lemon when done. Garnish with fresh cilantro leaves and boiled eggs. Oh what a morning.. What a fun class !! 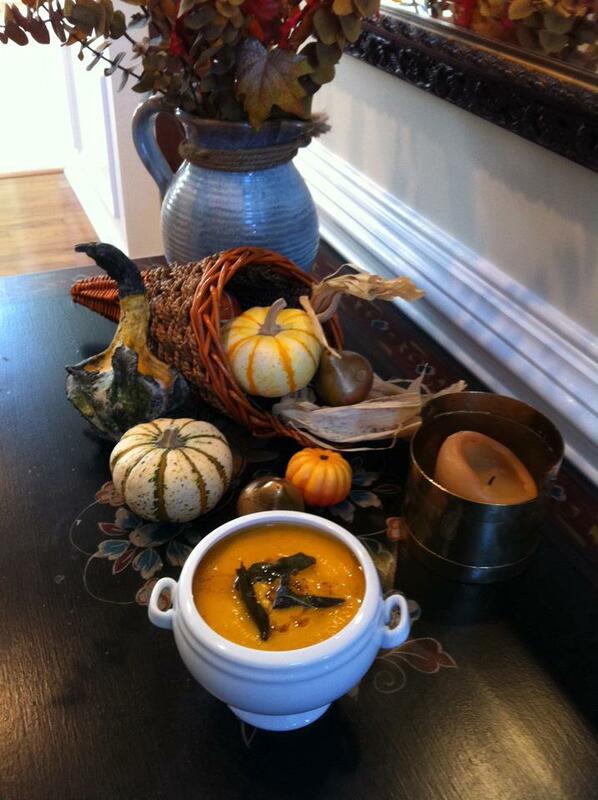 We made so much.. We started with Butternut squash soup with a sage brown butter…. We also made a pork tenderloin with a cranberry onion jam, and finished off with warm apples and a cinnamon spice crumble…. and there was wine in the middle somewhere 🙂 Nap time now.. 🙂 Join us the next time.. Sign up and “like us” on Facebook. The weather is changing. There is a gentle nip in the air. Nothing is more satisfying than a bowl of soup during this season. You will notice that I do a lot of soups. The reasons are many. For starters, they are super easy, flavorful and so healthy. I also feel they are a complete meal. You can have protein, starch and veggies in one pot and you have a meal at your hands. Today, I am making a noodle soup. I think this is a fun soup if you have a child or are a child at heart. I remember growing up eating a lot of noodles. Maggi mostly.. all my Indian friends are smiling right about now. Eating Maggi noodles is almost like a right of passage in India. I remember making mine with a little extra broth so I could have that soupy feel to it. Then came the big bowl of Udon noodles. Yummy, satisying and heartwarming.. This recipe is my tribute to the many stages of my noodle soup loving childhood and well, adulthood. Simmer chicken broth, chicken, ginger, garlic and the bayleaves for about 10 minutes on medium heat. Add noodles and cook for about 3-4 minutes. Season with salt and pepper. Serve hot with fresh basil, cilantro leaves, lime wedges, mung sprouts, sliced green onions, chili sauce and soy sauce. Be on the look out for report of the upcoming cooking classes. What a fun way to prep for the holidays !! Check and like us on Facebook ! !